McMorran & Whitby are a secret presence in post-war British architecture. Led from the late 1950s by Donald McMorran and George Whitby, the practice represented an unbroken development from the monumental inter-war classicism represented by figures such as Charles Holden and Sir Edwin Lutyens. In seeking an alternative path for modern architecture, McMorran & Whitby produced durable buildings with a respect for context, but avoided any accusation of unimaginatively reproducing the past. Theirs was a progressive classicism full of invention and beauty. Being out of fashion, they suffered neglect but their work has increasingly won admirers and many of the buildings are now listed. This book is the first major publication on McMorran & Whitby’s work, with an inspiring combination of contemporary photography and previously unpublished archival material. 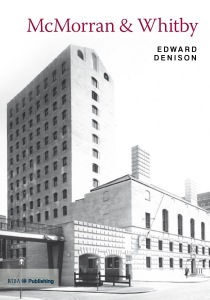 It is an essential read for architects, students, and historians, not least because it uncovers and celebrates buildings outside the mainstream that we need to understand and cherish. 1. Who Were McMorran & Whitby?